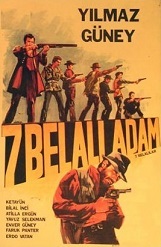 Yilmaz Guney stars in this Turkish rip-off of the classic western The Magnificent Seven. Includes many Spaghetti Western-type fight scenes played with a Turkish rock music score. (In Turkish language, with English subtitles).